A 36-hour period saw four men lose their lives and hundreds of families abandon their homes during some of the worst street violence of the time. 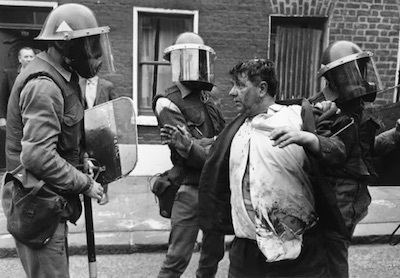 The trouble which erupted in the lower Falls area on Friday July 3 was sparked when the RUC and British army raided a house on Balkan Street at around 4.30pm. A crowd that had gathered outside refused to move and the British army used CS gas to disperse protesters. Crowds built barricades at various points around the lower Falls and the road was the scene of numerous street battles. A bus was hijacked to block a street junction and military vehicles were stoned. At 10.20pm, as fighting continued, a helicopter with a loud speaker flew over the area and a voice announced that a curfew was being imposed. The voice advised that anyone who was caught out of doors would be arrested. British military vehicles lined the Falls Road. As many as 300 families had to leave their homes and those who remained spoke of hearing sporadic gunfire after nightfall. Despite periods of calm, the British army continued to fire gas cylinders - some through windows where families were huddled for safety. Buckets and basins filled with a mixture of water and vinegar sat outside front doors so that those involved in clashes could wet rags to protect them against the stinging gas. Fighting continued throughout the night and at one point 1,000 troops swooped on the area. Political representatives, priests and community leaders went from street to street trying to calm the situation. However, the army continued to fire gas canisters. By the next morning three men were dead and another was fatally wounded. Charles O’Neill was a 36-year-old invalided ex-serviceman from Linden Street. He was mowed down by an army saracen. It was widely believed that he had been deliberately run over. William Burns was a 54-year-old bachelor who was shot dead on the step of his home on the Falls Road. The shooting happened two hours before the curfew and residents said he had been chatting to a neighbour. Patrick Elliman was a 63-year-old retired boot repairer and former goalkeeper with the Antrim hurling team. Troops at barbed wire barricades were taken by surprise by the chanting, singing, yelling women. They marched down the Falls Road waving shopping bags, bottles of milk and loaves of bread. Some wore aprons, mothers clutched the hands of small children. Some were in their Sunday best after coming from Mass. Many of the women stopped to hand in their gifts at a school hall. The Legion of Mary and Knights of Malta set up an emergency food centre in Sultan Street. Reports described how within minutes of it being open, women and children from other areas formed a long queue eager to hand over what they could donate. It was following this that reports began to circulate of soldiers looting shops and houses. Stories of verbal insults and abuse at the hands of the soldiers also began to emerge. Residents reported that soldiers had wrecked house after house, ripping linoleum from floors, smashing doors and windows and throwing clothes around rooms. There were also reports of soldiers smashing a crucifix and religious statues. A centre was set up in Balkan Street to record acts of damage by soldiers. Within two hours 150 complaints had been received.